Google can now tell you how much solar energy you could generate by installing solar panels on your house - if you live in the right place. 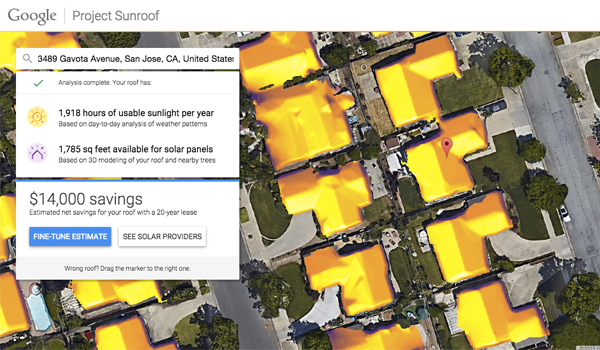 The firms new Project Sunroof tool considers factors like roof orientation, shade from trees and nearby buildings and local weather patterns to work out how much sun will hit your roof. Users then input their typical electricity bill to find out how much money they could save. The online tool is currently only available for people living in San Francisco, Boston and Fresno, but Google said they will be looking to improve the tool and expand its coverage in the coming months. Google’s Carl Elkin, the engineering lead for the project, said the tool should help more homeowners take advantage of the record-low prices of solar energy. “But, as a volunteer with the Boston-based solar program Solarize Massachusetts and a solar homeowner myself, I’ve always been surprised at how many people I encounter who think that ‘my roof isn’t sunny enough for solar,’ or ‘solar is just too expensive.’ Certainly many of them are missing out on a chance to save money and be green. edie recently chronicled five ways in which the company has become a green giant, including its super-efficient data centres, trailblazing driverless cars and groundbreaking new headquarters. Google is also utilising its Street View system to map air pollution, with the successful pilot project in Denver set to be expanded.